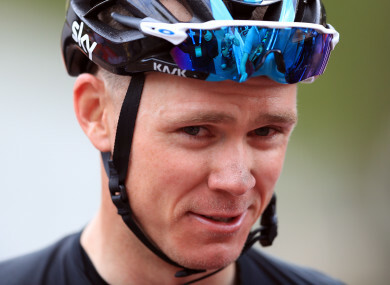 CHRIS FROOME SAID today he is “confident” of progress in a probe into his adverse doping test as the British rider prepares for his first race of the season at this month’s Ruta del Sol. Froome will be part of Team Sky’s line-up for the five-day stage race in Andalusia, southern Spain, which runs from February 14 to 18. Team Sky revealed in December that the 32-year-old had tested for elevated levels of the asthma medication salbutamol during the Vuelta a Espana, which he won for the first time in September. Although salbutamol is permitted in certain doses, the four-time Tour de France winner gave a urine reading of twice the allowed limit. However, as the medication can be taken legally, Froome was not suspended by cycling’s governing body the UCI but merely asked to explain the elevated reading. Team Sky said in December they were providing information to the UCI over the matter and confirmed in a statement on Monday that the process was ongoing. “I’m confident that we will be able to get to the bottom of what has happened and I’m working hard with the team to do that,” Froome said in the statement on the team’s website. Team principal Dave Brailsford said: “We all recognise that these are difficult circumstances but it’s important for all sides that this process is conducted fairly before a final conclusion is reached. Froome, who will line up in Spain after spending the early part of the year training in South Africa, last raced the Ruta del Sol in 2015, when he took overall victory and picked up a stage win along the way. “I have put in a hard training block in January,” said Froome. “It’s been good to be out on my bike and to get the miles under my belt. Last week the British rider strongly denied a newspaper report that he is seeking to negotiate a short ban rather than fight to prove his innocence over the adverse test. UCI chief David Lappartient said earlier this month that Froome should be suspended over the adverse test and some of the rider’s main rivals have hit out at cycling authorities for failing to ban him. In 2016 the Russian hacking group Fancy Bears revealed that British rider and former Tour de France winner Bradley Wiggins had received three therapeutic use exemptions (TUEs) during his career at crucial moments — before the Tour in 2011 and 2012 and the Giro d’Italia in 2013. Wiggins said he needed to take the corticosteroid triamcinolone to treat allergies but some ex-cyclists have spoken out against that, saying it would have given him a significant performance boost. Email “Chris Froome to start 2018 season next week despite ongoing investigation into adverse doping test”. Feedback on “Chris Froome to start 2018 season next week despite ongoing investigation into adverse doping test”.